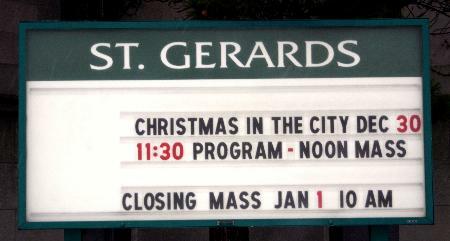 On January 1, 2008, St. Gerard�s Parish, located on the corner of Bailey and East Delevan Streets celebrated its final mass and closed its doors forever. Gerard�s was another casualty is process of streamlining the Buffalo Catholic Diocese. St. Gerard's RC Church was founded in 1902 with a handful of German families as members. Prior to the founding of St. Gerard's Parish, a small enclave of Italian immigrants had taken up residence on East Delavan near the city line. In 1888, Cesido Saltarelli came from his hometown of Pescasseroli in the Abbruzzi Province of southern Italy and settled in the area. Soon after, twenty men and three or four women joined him. The following year ten other families arrived and the neighborhood, separated from the city by open fields and orchards, grew to contain over 200 townspeople. On streets developed by John G. Floss, owner of over 200 bowling alleys in Western New York and Pennsylvania, they established a distinctly Italian neighborhood. The current building was erected in 1911 and designed by the architects Schmill & Gould. On 24 September, 1911, the members placed the cornerstone of the current building, dedicating it two years later. At this time, a temporary roof was in place at the base of the clerestory as resources would only permit them to build that far. With a new, somewhat imposing building to worship in, a period of significant growth began for the parish. In late 1930, the congregation desired to complete their church. Workers raised the clerestory of the nave to its present height of 60 feet and added the 110 foot, three stage bell tower. At this time, the Rambusch Decorating Company of New York City directed the redecoration of the interior of church. The building, in the Roman Basilica style, is based on the design of St., Paul's Outside the Walls in Rome, being one-third as large. 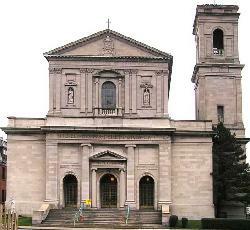 Constructed of Indiana limestone, the main facade features two niches containing statues of St. Gerard and St. .Joseph. Carved by local sculptor Angelo Gatti, the St. Joseph figure features a miniature of the church at his feet.